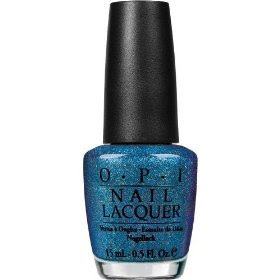 I was very excited about the OPI polish colors inspired by the upcoming Tim Burton film Alice in Wonderland. I purchased this one, as well as Mad as a Hatter. I do not like Absolutely Alice and will be giving it away. It is way to chunky and dried my nails out terribly. I am not sure what the problem is, but this is a really bad formula. It also took 10 cotton balls and half a bottle of polish remover to get it off. I loved Mad as a Hatter though (I'll swatch that soon). 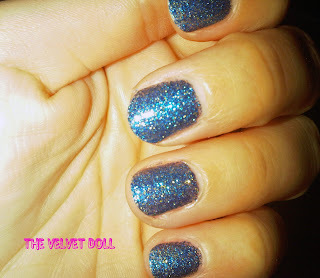 If you are looking for a blue sparkly polish, I would suggest China Glaze's Dorothy Who. I tried this recently at State Beauty and loved it. It is not "chunky" at all and shows up a very bright and shiny blue. I'm glad it isn't just me! I was so sad; the color looks beautiful in the bottle, but it really messed up my nails. That China Glaze color is pretty on!